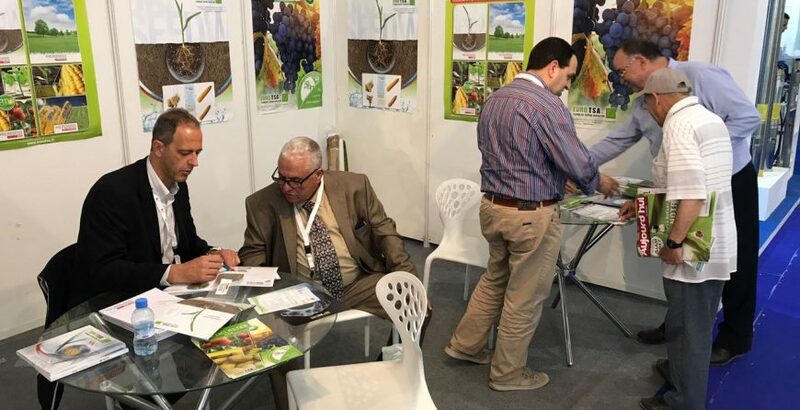 EURO TSA participated at SIAM 18 to 23 April 2017 into the AGROFORNITURE POLE at STAND N ° A149..
During the fair, Natural Force, Cleanclaster, Acticlaster and Microseed WR have attracting the attention of Moroccan farmers. MICROSEED WR is a fertilizer containing an innovative polymer that able to increase the soil water retention capacity for to create around the seed and the roots a COMFORT ZONE for plant development. This polymer is capable to keep the soil’s water and release it gradually to seed or roots for the plant development. MICROSEED WR promotes seed germination, plant development and cell turgor in particular water stress condition such as: high temperature, dry years or in sandy soils. NATURAL FORCE increases quality with vegetable amino acids. ACTICLASTER contains gluconic acids, oligosaccharides, reducing sugars can improve the quality of the productions. The product has also an important vasodilating activity by limiting the problems of interruption of lymphatic flow in plants subjected to physiological stress of various nature. ACTICLASTER overall predisposes the plant to overcome the stress in an efficient and increase the quality of the yield. CLEANCLASTER ensures quicker Glyphosate and Glufosinate ammonium absorption, it’s characterized by a greater basipetal and acropetal translocation for to enhance herbicide action. CLEANCLASTER allows to reduces until 40-50% Glyphosate and Glufosinate ammonium dosage normally for to making environmental benefit. CLEANCLASTER permits to obtain the best results against to poorly sensitive and resistant weeds on glyphosate and Glufosinate ammonium products. CLEANCLASTER allows to obtain a greater readiness action also low temperatures.